INDO-SASSANIAN. Gurjura Confederacy. 8th to 10th century. Billon Drachm. These were struck in the Gurjarat - Malawa region of India. Denomination : Billon drachm. Date : ca. AD 780 to 980. Size : 19.0 x 20.1 mm. Weight : 3.86 grams. Reference : MN 355 to 364 variety. Grade VF with the typically crude strike, and slightly rough metal. The designs on these are always incomplete. 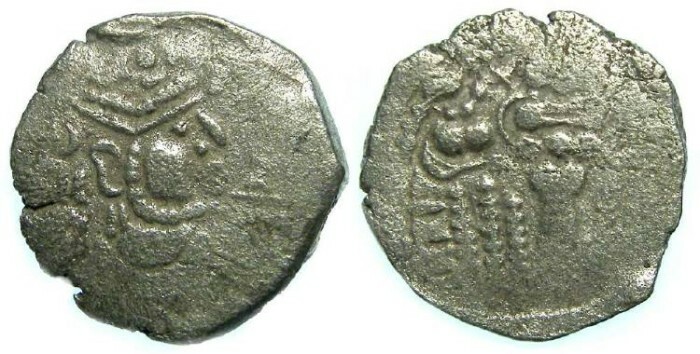 Obverse : Stylized Sassanid style head right, with Brahmi characters to the front and below. Reverse : Sassanid style fire altar with attendants at the side.